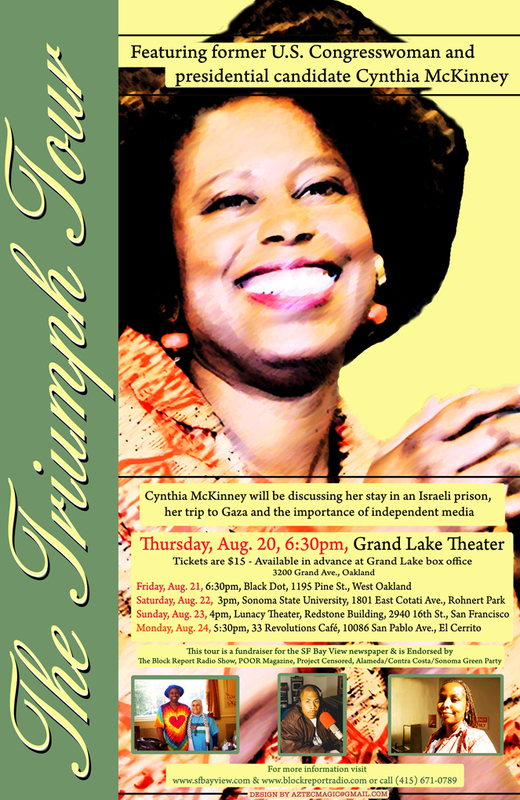 The SF Bay View newspaper and Block Report Radio are proud and excited to announce that former Congresswoman and presidential candidate Cynthia McKinney is coming to the San Francisco Bay Area to tell the story of her three valiant attempts and final success at entering Gaza to show solidarity and provide humanitarian aid to its besieged people. Her generosity extends to the SF Bay View; proceeds from all her appearances will keep this struggling newspaper alive and thriving. From what we hear, the Grand Lake will be filled to capacity, so, to get a good seat, pick up your tickets in advance at the Grand Lake box office, 3200 Grand Ave., Oakland. Thursday morning, join Cynthia in supporting her good friend Minister of Information JR, chief coordinator of her tour, at 9 a.m. in Courtroom 112 at 661 Washington St. Pack the courtroom for his preliminary hearing on the ridiculous but deadly serious trumped-up charge of felony arson of a trash can – Oakland PD punishment of the journalist who is their most outspoken critic. Featured at the Grand Lake on Thursday will be a film composed of footage Cynthia shot in Gaza; an update on Oscar Grant by his Uncle Bobby and his best friends’ dad, Jack Bryson; a first anniversary update on the case of Nadra Foster, who was viciously beaten by Berkeley police on Aug. 20, 2008, inside KPFA when they were called by KPFA and Pacifica management claiming this young mother was trespassing even though she had been trained there and had served as an unpaid programmer for a dozen years; an update on Haiti by beloved Haiti Action co-founder Pierre Labossiere; uncensored poetry and spoken word by Chela Simone and Raymond Nat Turner; a welcome to Cynthia by her friend Cindy Sheehan; and, saving the best for last, conversation with Cynthia by Dennis Bernstein, host of KPFA’s investigative news magazine, Flashpoints. 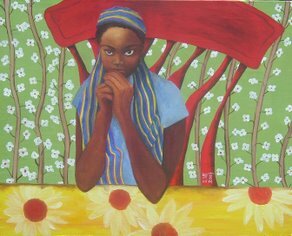 The reception for Cynthia at the Black Dot on Friday is a relaxing opportunity for you to talk with Cynthia over wine and cheese in this legendary gathering place hosted by the star of CNN’s Black in America 2, Marcel Diallo, mayor of West Oakland. The program at Sonoma State University on Saturday is in the capable hands of Project Censored founder Peter Phillips and Sonoma Greens leader Tim Smith. In San Francisco at the Lunacy Theater on the second floor of the Redstone Building on Sunday, you’ll hear not only from Cynthia but also from the celebrated Po’ Poets of POOR Magazine and popular poet J. Rich and from Dr. Ahimsa Sumchai about the struggle for environmental health justice in Hunters Point, Daniel Landry on the struggle for housing justice at King-Garvey Co-op, Pierre Labossiere about the struggle for political justice in Haiti and members of the San Francisco 8 about the struggle for criminal justice, not just-us. The program at the 33 Revolutions Café in El Cerrito on Monday, in the capable hands of Contra Costa Greens leader Rev. Sandra Decker, features a word from SF Bay View publisher Willie Ratcliff and from Mickey Huff of Project Censored, music by pianist Peter Strauss and dinner and discussion with People’s Advocate Cynthia McKinney. We are profoundly grateful to all of you who are working with us to make this a tour that will transform the Bay Area and beyond. Feel free to contact POCC Minister of Information JR at blockreportradio@sfbayview.com or Mary Ratcliff at editor@sfbayview.com or (415) 671-0789 with any questions or suggestions. Free Gaza! Free the Gaza 21, including Cynthia McKinney, from Israeli jail! These Triumph Tour fundraisers are essential to the survival of the SF Bay View newspaper. But more than that, they’ll blacken the media whiteout of Cynthia’s recent and lifelong breakthroughs in countless struggles for peace with justice. A full house at every stop on her tour will show the scaredy-cat media the power of the people’s love for the courage of this most outspoken member of Congress in memory. Remember Paul Robeson? So adored that he drew massive audiences throughout the world, he nevertheless faced a total media whiteout in the U.S. – except for one radio station: KPFA, 94.1 FM. His own government snatched his passport and silenced him for decades. Cynthia McKinney is the Paul Robeson of our time. And once again, KPFA programmers are breaking through the media whiteout. You’ll hear Cynthia on show after show over the next week. Be the media! Spread the word! By promoting and packing each event on this tour, YOU ARE THE MEDIA THAT MATTERS! You’ll hear what the mainstream media has closed its eyes, ears and mouth to. While Cynthia can shatter myths with her profound understanding of controversies from the Congo to 9/11, her emphasis on this Triumph Tour is on Gaza. Think what people glued to mainstream media won’t hear: Embarking last December on a Free Gaza boat trip to break the blockade of humanitarian aid to Gaza, Cynthia was daring Israel to prevent the passage of a former member of Congress through international and Gazan waters; she was never in Israeli waters on either trip. In December, days before its air and ground bombardment of Gaza, Israel ordered its navy warships to ram the Free Gaza boat Dignity, nearly sinking it – and Cynthia doesn’t know how to swim! Returning June 29 on the Free Gaza boat Spirit of Humanity, she and all 21 aboard, including Nobel Peace Prize winner Mairead Maguire and numerous journalists, were surrounded by Israeli warships, their boat was boarded in international waters in what NY City Councilman Charles Barron called an “act of piracy,” and they were all booked into prison for a week of catching catnaps on a concrete floor, eating meager rations of mostly bread and water but also meeting many Africans in an Israeli prison population that is – surprisingly – mostly Black. A day or two after Cynthia was deported back to the U.S., she accepted an invitation from British Member of Parliament George Galloway to join Viva Palestina, then stuck at the Egypt-Gaza border with a long convoy of vehicles and medical aid for Gaza. She and Charles Barron led many days of negotiations with an unfriendly Egyptian government that succeeded in allowing some – not all – of the convoy to cross triumphantly into Gaza on July 15. Black people everywhere cheered when they learned that the only well known people with Viva Palestina beside Galloway were all Black: Cynthia McKinney, Charles Barron and M-1 of dead prez. Wait ’til you hear from Cynthia what she saw inside Gaza! She’ll be armed with videos on her Bay Area Triumph Tour. People glued to the mainstream media won’t see them or hear from Cynthia, but you will! DON’T MISS SEEING, HEARING AND MEETING CYNTHIA McKINNEY AUG. 20-24! DON’T LET YOUR FRIENDS MISS THIS RARE OPPORTUNITY! If you’re in the Bay Area, please print and distribute the flier posted above; it looks gorgeous in print. The high resolution file is too big to post here, so please email editor@sfbayview.com and we’ll email it to you. If you’re not in the Bay Area, please spread the good news to people who are. Watch right here for frequent updates. Join Cynthia McKinney for the very first stop on her tour – attending the preliminary hearing on the ridiculous, trumped up charge of felony arson of a trash can against her good friend, POCC Minister of Information JR – who is the one to thank for organizing Cynthia’s Triumph Tour. You’ll recall he was arrested by Oakland police, who know him well as their most severe critic, while on assignment Jan. 7 for the SF Bay View, covering the first Oakland Rebellion following the execution of Oscar Grant. Charges have been dropped against nearly all the 100-plus arrested that night – but not JR. The OPD still has not returned his camera, and they’re still determined to railroad him into prison. Pack the courtroom Thursday, Aug. 20, 9 a.m., at 661 Washington St., Courtroom 112! Stop the whiteout of independent journalists! Support independent media! Celebrate, support and join Cynthia McKinney at every stop on her Triumph Tour, Aug. 20-24! In San Francisco at the Lunacy Theater on the second floor of the Redstone Building on Sunday, you’ll hear not only from Cynthia but also from the celebrated Po’ Poets of POOR Magazine and popular poet J. Rich and from Dr. Ahimsa Sumchai about the struggle for environmental health justice in Hunters Point, Daniel Landry on the struggle for housing justice at King-Garvey Co-op, Pierre Labossiere about the struggle for political justice in Haiti and members of the San Francisco 8 about the struggle for criminal justice, not just-us. The program at the 33 Revolutions Café in El Cerrito on Monday, in the capable hands of Contra Costa Greens leader Rev. Sandra Decker, features a word from SF Bay View publisher Willie Ratciff and dinner and discussion with People’s Advocate Cynthia McKinney. That is good news! By the way, what a beautiful shirt (on a beautiful lady). Give the people single payer!